The UBS Art Collection presents 54 works by Ed Ruscha, one of the most iconic contemporary artists, at the esteemed Louisiana Museum of Modern Art in Humlebæk, Denmark. This group of paintings, works on paper, and prints was assembled over the course of decades starting in the 1960s, a moment that marked both the genesis of the collection and the beginnings of the artist’s career. This is the first time that the works will be exhibited together in one place to the public. Ruscha’s oeuvre is not easily confined to a category. 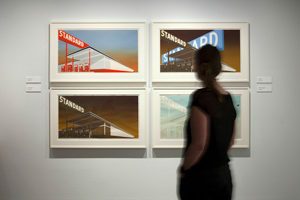 Ruscha employs everyday objects such as comics or consumer products. Gasoline stations, a signature subject of the L.A. based artist, are referenced in several works. Another highlight will be six variations of the famed 20th Century Fox movie studio logo that the artist could see from his studio in East Hollywood. Ruscha’s more conceptual works depicting playful single words and phrases, which are telling of his background in the advertising industry, feature prominently in the exhibition. The UBS Art Collection is at the core of UBS’s commitment to contemporary art and is widely recognized as one of the most important corporate collections with more than 30,000 works including paintings, photographs, drawings, prints and sculptures by artists from more than 70 countries. Recent acquisitions include works by Derrick Adams, Etel Adnan, Ding Yi, Sam Gilliam, Sheila Hicks, Carrie Moyer, Catherine Opie, Trevor Paglen, and Shahzia Sikander.